Anyway, I got it this week, and I’m totally in love. As you see, I’m not using the moon in this card, because I just couldn’t resist those tiny stuffies. I made this card for the Global Design Project challenge this week. 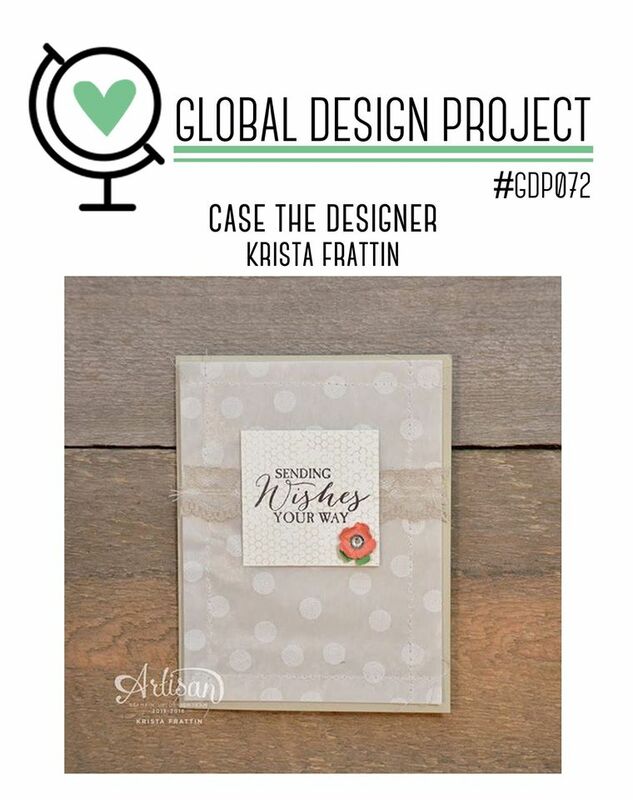 The challenge is to CASE (Copy and Selectively Edit) the fab Krista Frattin’s beautiful card (below). *The card base is 4.25″x5.5″ (11″, scored at 5.5″), Mint Macaron (I’m going to miss this color SO MUCH in June!). *The white panel is Shimmery White cardstock, cut to 4″x5.25″. I used my Aqua Painter to do the watercolor wash. I wet the whole panel except the outside edges. The water will pull the ink all around, so any space you leave dry is much less likely to end up colored. I put a few drops of Daffodil Delight reinker on a clear stamping block and picked up color with the Aqua Painter, then started painting color on. You don’t need to paint the whole area, as the ink will spread a lot on its own (as long as the background is wet). *After drying the panel with my Heat Tool, I stamped the trio of stars from the stamp set several times across the area where my Stitched Oval would go, using Archival Black ink — this ink is good for watercoloring, because it won’t smear, as long as you let it dry before you watercolor. 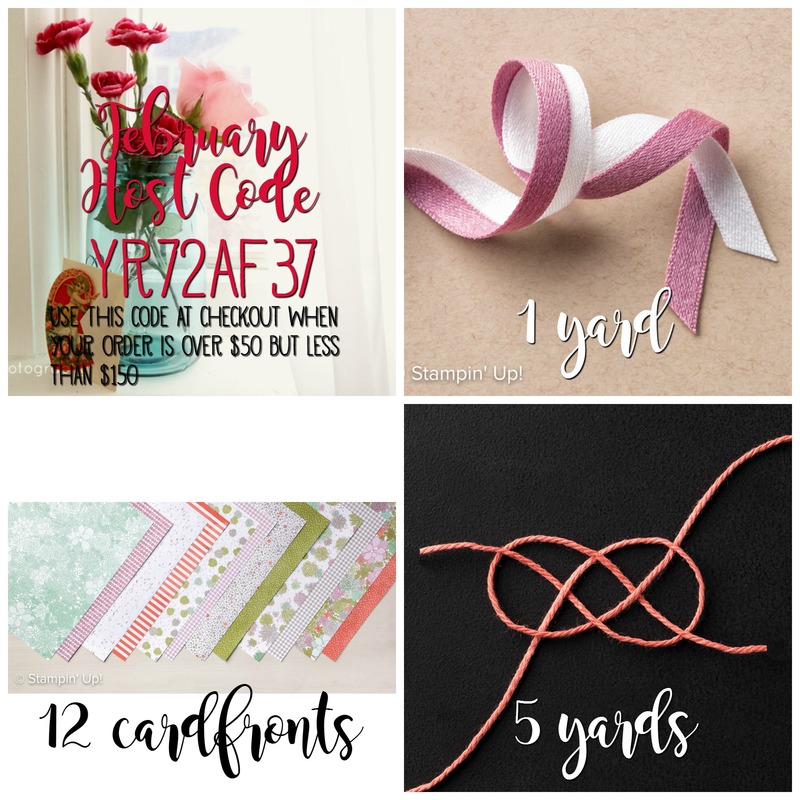 So when you’re CASEing, a ribbon can become stamped images or a paper strip or a line of sequins. Whatevs — it’s your card! I took a little more Daffodil Delight ink and painted all the stars I stamped that weren’t already yellow from the background. I used Tear & Tape to attach the panel to the card base, because paper that’s been wet buckles, and Tear & Tape will hold it in place best. The green glue would work pretty well here, too. 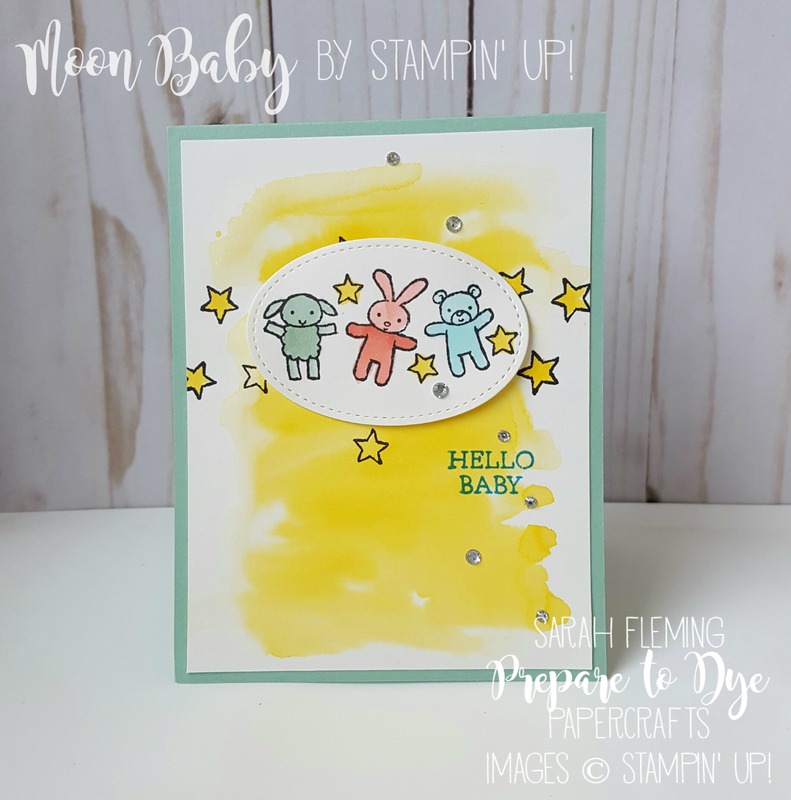 *I stamped the trio of stuffies on Shimmery White cardstock, then painted them the same way with three colors: Mint Macaron, Flirty Flamingo, and Tempting Turquoise. I’ll give you a tip about painting with Mint Macaron. You really need to dilute this color, or it comes out looking sad and dingy. So squeeze a lot of water into your water pen tip to dilute the color, and also run off quite a bit on your Grid Paper before painting the little lamb. This lamb would also look adorbs in Smoky Slate. I painted the bunny in Flirty Flamingo and the bear in Tempting Turquoise (I also diluted this one quite a bit, but just to make sure the black showed through). I intended this card to be neutral, for either a boy or a girl, but I think next time I would put the Mint Macaron in the middle. I again painted the stars with Daffodil Delight ink. I cut the image out with a stitched oval from the Stitched Shapes framelits and popped it up on Dimensionals. One more tip on this part: Don’t wet the stuffed animals before you paint the color on. The space is so small that you want a lot more control over where the color goes. *The sentiment is stamped in Tempting Turquoise, and you can see my paper was still a little damp, and the sentiment ran a bit. I don’t mind; it goes along with the watercolor look, so I kept it. And then I love a spray of rhinestones to finish off a card (as you’ve probably noticed). 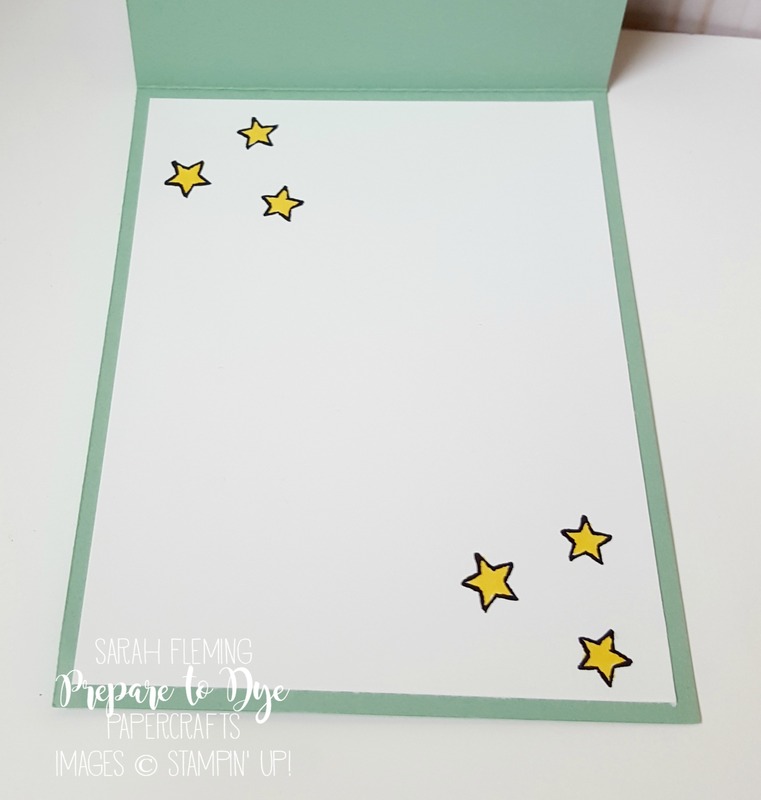 *I stamped the stars again on the inside, on a panel of Whisper White cardstock. Since this cardstock is not meant for watercoloring, I made sure the tip of my Aqua Painter was mostly dry, then picked up a tiny bit of ink with the Aqua Painter, then brushed it onto each star, being careful not to squeeze the water brush while coloring. You could also use a Daffodil Delight marker, but I really love the more saturated color you get with the reinkers.